My friend Lenny, loves mice. He sneaks up on them, snatches them, taunts them, smells them, licks them, bites them, kicks them, tosses them, and so on and so on, and so on. That is.....until they all disappear!!! 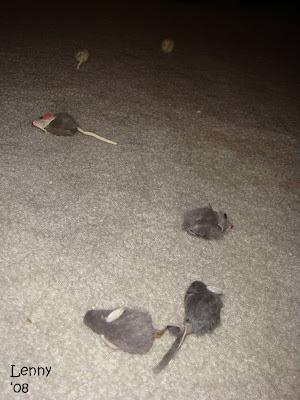 Lenny has a cool Daddy who secretly traps them so when Lenny leasts suspects it.............he stumbles upon an eye-full, paw-full and jaw-dropping-mouth-full of "FRESHLY-CAPTURED" mice!!! Wow! It is all I can do to not pounce!!!!!!!! I know!!!!!!! Junior, I think you and I wouldn't be able to sit still for a second!